Crowned-pigeons are the largest members of the family that includes doves and pigeons. 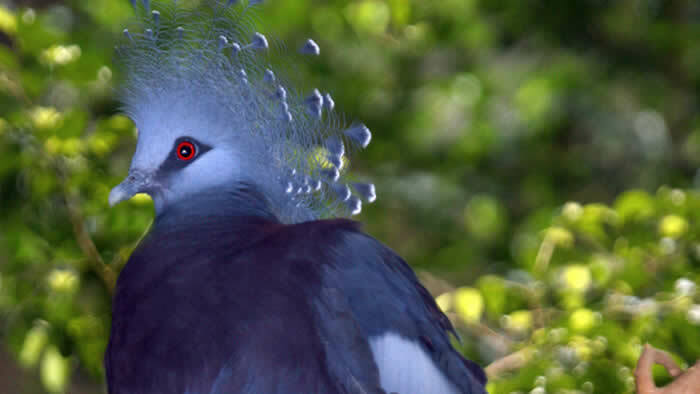 The Victoria crowned-pigeon is one of three unique pigeons native to New Guinea. It is named for the elegant, blue, lace-like crest on its head. They forage on the forest floor for fallen fruit (particularly figs), berries, seeds, and insects. Papua New Guinea (in Indonesia), typically in lowland swamps and forests. 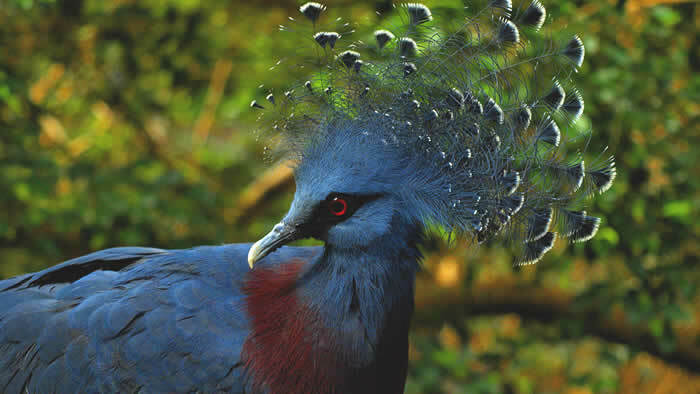 The Victoria crowned-pigeon often gathers in groups of 2-10 individuals. These groups spend most of their time on the ground, only flying up into the branches of trees when startled, or when roosting overnight. This species is hunted for both its meat and beautiful feathers. Both hunting and loss of its lowland forest habitat are contributing to its decline. It is listed as near-threatened. This bird was named for the British Monarch Queen Victoria. 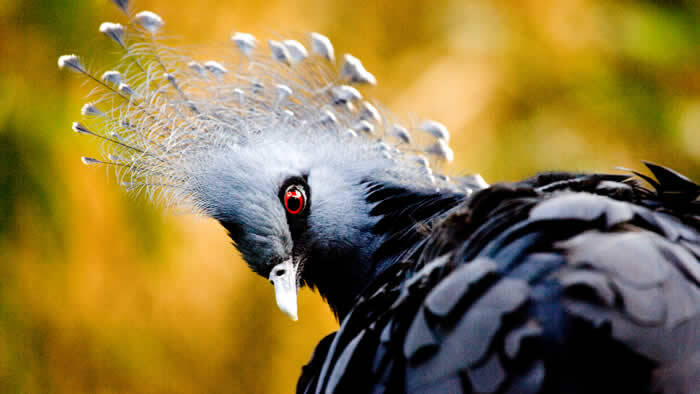 Crowned-pigeons are related to the extinct dodo, another large ground-dwelling pigeon. The Victoria crowned-pigeon and its close relatives are unique among pigeons in that they having no gall bladder. They also lack an oil gland. The male courts the female by bowing before her, wagging his fanned tail and “booming” (the loud, hollow whoom-whoom-whoom-whoom sound you may sometimes hear on the Zoo’s Tropics Trail). He brings her sticks, which she weaves into a nest for her single white egg. In many ways, the Victoria crowned-pigeon is the closest 21st Century humans will ever come to another famous species of pigeon, the dodo. Dodos were also huge, ground-dwelling pigeons (larger even than the Victoria crowned-pigeon), found only on a single island and completely unable to fly. Hunting by humans and the introduction of non-native predators drove the dodo to extinction in less than 100 years.